THE Capricornia Cays National Park (CCNP) is one place that the DIY angler can pull off a breathtaking GBR island holiday that is both affordable and doable. For the sportsfisher there is no shortage of options of tropical reef fish and pelagic species. A holiday out on one of the camping islands will without doubt, blow you away…in more ways than one! There are an impressive array of species available for the DIY angler. Just so you know, a coral cay is a small, low-elevation, sandy island on the surface of a coral reef that forms when ocean currents, laden with sediment, slow against old reef or emerging pieces of rock, and drop the sediment. As cay sediments are largely composed the remains of corals, algae and other animals, plants eventually grow and the guano from roosting seabirds further enhances their development. The Capricornia Cays’ has been described as, “stunning white beaches and coral reefs (that) leave a lasting impression. Their exceptional beauty and biological diversity make them internationally significant. Capricornia Cays National Park protects eight coral cays which rise just a few metres above the high tide mark - Lady Musgrave, North West, Masthead, Wilson, Heron, Erskine and Tryon islands and Broomfield Cay. Their biological diversity, exceptional beauty and the endangered plants and animals they protect make them internationally significant. The cays support the largest breeding population of endangered loggerhead turtles in the South Pacific. A large percentage of the Great Barrier Reef's seabird species visit each year to nest. Go reef-walking, snorkeling, diving, birdwatching, boating or fishing. You can camp on (three) of the eight islands. Camping fees apply and bookings are essential. Book well in advance for school holidays. Take water and a fuel stove. Seasonal closures protect breeding seabirds, turtles and vegetation. Access to Tryon Island is restricted. Check restrictions on activities such as spearfishing, anchoring, fishing and collecting HERE”. 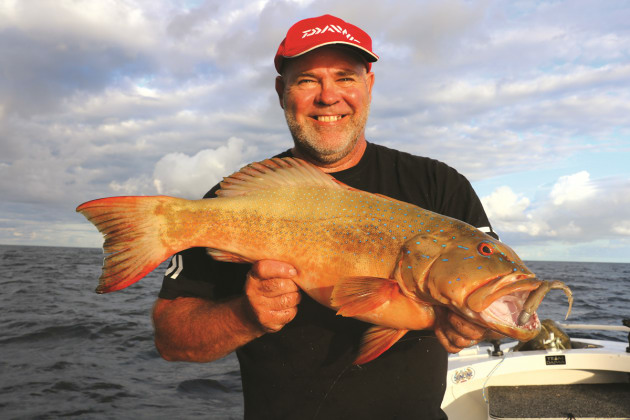 The CCNP is located almost 500 km north of Brisbane and 60-100 km north-east of Gladstone, by boat, which for a keen angler, can be a holiday in itself. Qld NP fees are really reasonable and at about $6.50/hd/night or $25.90/family/night, it’s much cheaper than in NSW! No matter what style of fishing you prefer, there’s sure to be an option out here; be it the AAA+ grade coral fin fish or gamefish, it’s all here. Dropping a big bait amongst the coral has been the signature tactic for GBR coral fin fish for decades, and it still works today. A large ball sinker running above a 6/0 – 8/0 hook on heavy line (24 kg+) is all you need, and pilchard and squid are popular baits. The idea is to let a fish hook itself by swallowing the bait (as opposed to striking at bites), and then pulling hard to drag it free of the coral. In a camping situation however, it’s unrealistic to keep enough bait frozen for the duration so just bring a block of pillies to get you started and then use strips of fillet of the fish you catch from there. Iodine bream, hussars and railway perch make for good strip baits. If wind keeps you on shore for days and your bait spoils, throw a lure in the shallows for more starter bait before the next trip. Expect to tangle with red-throat and grassy sweetlip and coral trout during the daylight and add red emperor in deeper water at night. In shallower water (to 20 m), it’s hard to beat the productiveness of a slowly sinking bait from an anchored boat. If the finfish are shy, this is the way to go. Use a 5/0 – 7/0 hook with a small sinker; enough lead to take the bait to the bottom over a minute or so. Just let a metre of line out at a time and stay alert for bites. Coral trout "rattle" a bait and sweetlip chew before swimming of with it, so let them hook themselves. Small amount of chook pellets act as berley without bringing sharks, but the sharks will arrive at some point, and once they do you’ll be advised to move to another spot. Another baitfishing style is the slow troll of bigger baits on weighted chin rigs or gangs weighted with a big sinker. 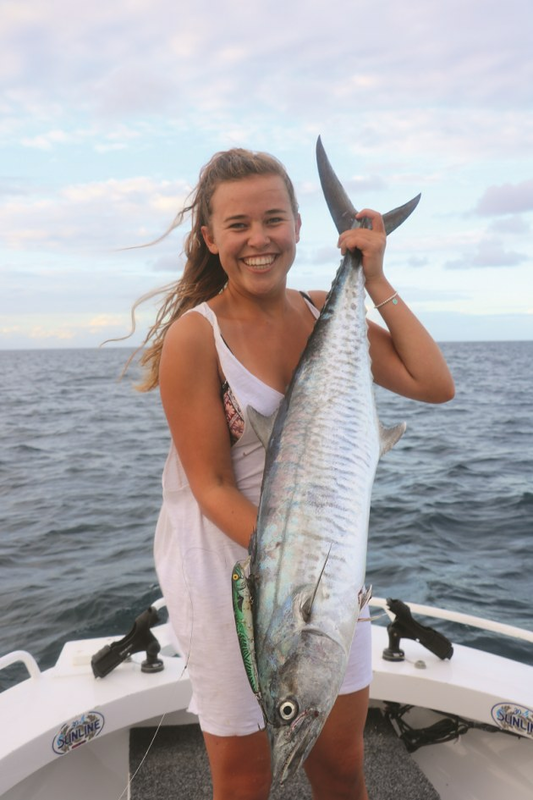 I think It’s the best way to catch gamefish, particularly big Spanish mackerel. Whole fish baits such as mullet, bonito or crocodile gars are ideal. I love to fish with soft plastics and coral trout are my target. The CCNP is, in my opinion, a SP angler’s paradise. This is how I love to fish and coral trout are my target. The idea is to work your plastic near the bottom and strike at every bite. I’ve had the most success with 100–125 mm fish profiles in natural colours, but others report flouro colours as their favourite. I don’t land trout every time I go out, but sometimes I get my five. When I find bigger trout, I have returned to camp fishless on many occasions. The fight of a trout is brutal from the word go, so success is often determined within seconds; they either cut the line on the coral or you deny them. It’s hard on gear, so take plenty of leader jigheads and plastics. In addition to-Man plastics as they are largely indestructible, lasting many times longer than others. When smaller trout are biting, a 15-kg spin outfit should get you on top of things most of the time, but I use 24kg braid on a jig rod when I need too – and still lose a lot. You’ll land more fish by working your SP near the boat as opposed to making long casts because the angle on a long cast makes it more difficult to lift trout off the bottom. As well as trout, sweetlip take plastics readily and they fight hard as well. Cobia and mackerel are regular customers, although most mackerel bite through nylon leader material. I’ve hooked one marlin on a SP but was spooled in the process and I’ve managed to bring a sailfish to the boat. Trevally are common, but it’s hard to succeed on bigger fish in shallow water… and of course, there’s plenty of sharks around as well. Hardbody lures of all sorts will be successful here. Trolling hardbodies is they way most people tackle mackerel. They prefer slightly deeper water off the edge of the reef or high spots in deeper water. The hard part can be in the finding, but once located you can return to the same spot again and again. Lighter gear is fine in this situation, although any lighter than 15 kg makes it hard to set large trebles once a fish is on, and always rig your lures with a wire trace (44 lb at least), to guard against sharp teeth. As a camper, big fish tend to get wasted, so I prefer to keep the smaller ones, and by taking a portable smoke box, you can cook up a delicious feed that tastes as good chilled as it does hot! Deep diving minnows trolled along reef edges are dynamite on many species. We’ve caught all sorts of things, including large trout, doing just that in crook weather. Bring out the heavy gear for this. Working a swimbait across the surface results in spectacular surface hits from all sorts of things. Mackerel, cobia, trevally and tuna are the most common culprits, although the next gamefish hooked on a swimbait will not be the first. As with hardbodies, I use a 15 kg spin outfit and wire trace for the mackerel. Casting lures in the shallows is heaps of fun. Shallow divers, swim baits and poppers will be hit by trout, sweetlip and GTs, and whilst most are smaller here (except GTs), they put up a great fight in shallow water. Boats fitted with electric motors are ideal, but not essential, and fishing these spots on foot works as well, as long as you can secure your catch in a leak-proof carry bag (otherwise you may end up being tailed by a reef shark or two). 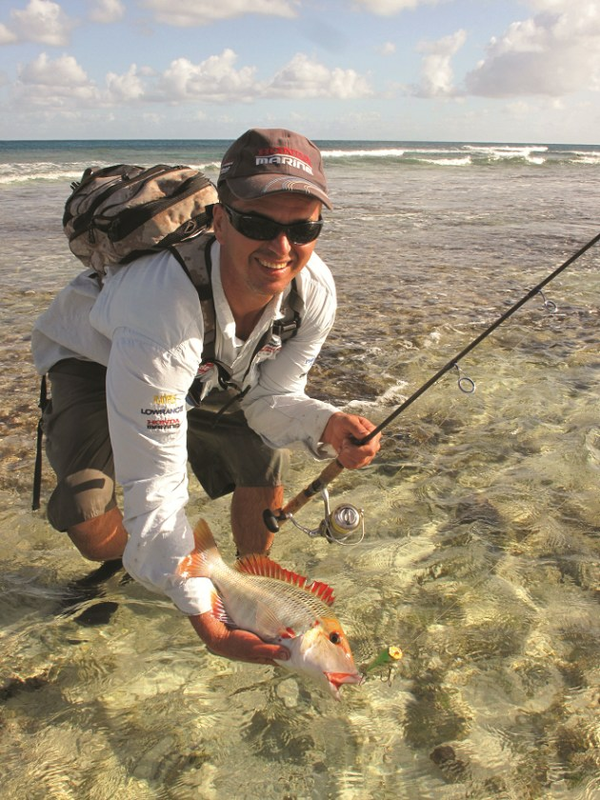 There’s plenty of opportunities for the fly angler, from casting at small trevally on the sandflats, coral bruisers in the shallows to pelagic species out in open water. Schools of bait move around in all areas and feeding fish are rarely far behind. Large GTs, and to a lesser extent cobia, cruise around the flats at high tide, particularly adjacent to rocky points, so that is worth keeping in mind. It's going to be windy at some stage so find a sheltered spot. Three cays are open for camping and each has something special. Masthead Island is 60 km north-east of Gladstone. It offers self-sufficient camping under casuarina trees, with lagoon views. 50 people can stay at one time, but it has no amenities. The beach is small, and requires care when anchoring in bad weather, but it’s possible to have the whole island to yourself if you can organise sufficient people. 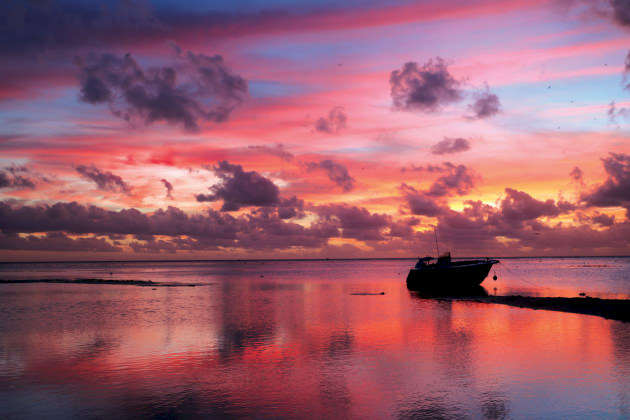 Lady Musgrave Island offers shaded campsites with an all-tide accessible lagoon for boating access. The coral inside the shelter of the lagoon is a drawcard for many. Facilities include: composting toilets, emergency radio, fuel storage and compressor bunker. Unfortunately, the camping area is on the opposite side to where you moor boats and groups of tourists visit daily. Northwest Island is the largest of the camping cays and is 75 km north-east of Gladstone. 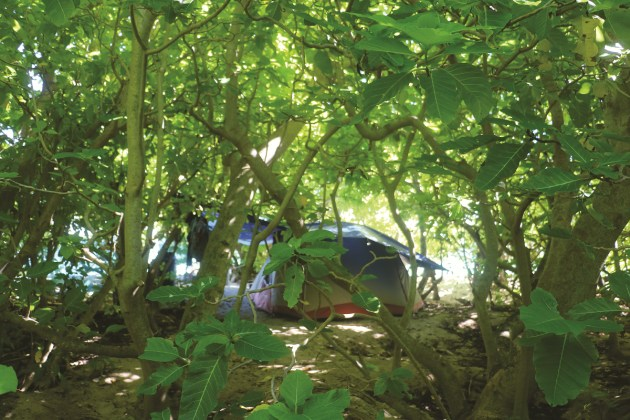 Camping is in the shade of pisonia forest. Boating access is only available during the top half of the tide as the reef drains dry at lowtide; but you can snorkel and dive in surrounding waters or reef walk at low tide. Up to 150 people can camp here at any one time. Facilities include: composting toilets, fuel storage and compressor bunker. Mobile phone service is fairly reliable up the telecom tree (but from one provider). You’ve got choices here because on a calm day and with a 5m+ boat, it is possible to run out the islands under your own steam. This is often the way the locals do it, but only for a short stay because you’ll need fuel, water, food and camping gear. Not only is this a lot of gear to carry, but you’ll have to wait for calm weather if it’s blowing … but more about that later! Alternatively, you can book a berth with Curtis Island Ferries for all your gear and your boat. They also provide 200 L barrels of freshwater ($15 ea. ), rubbish removal and a place to sleep on the way out (using your airbed and pillow). These are big barges that travel in all but the most adverse weather, but we warned, someone is always crook, so bring seasickness tablets or a doctor who will jab you, just in case! The final tactic used by some is to combine the two, and more than one of my friends has battled through 20 kt SE winds for a few hours in order to be there when the family arrives. At just under $300/hd, I reckon the barge is money well-spent! To go on the ferry, call Curtis Ferries and tentatively book your arrival and return dates. Then get onto Qld NP’s and book a campsite, then complete ferry paperwork (that requires camp permit number) and pay your non-refundable deposit to confirm passage. Done! Wind is the big downside of being on the GBR. It’s a windy place, with more windy days than less windy days, however it’s possible to fish in 20 kt wind in the lee shore of islands (there’s no swell), and there’s always lots to do besides fish. But you should expect a blow or two during any holiday, and the possibility of wind every day is a real one. That said, so is the chance of totally glassed-out days! Whilst there’s no insects to battle with, there are a few sand centipedes. They are big suckers with a painful bite, but rarely seen during daylight: so, check your shoes every morning and wear thongs at night. The other "hassle" can be an invasion of newly hatched turtles; when they spot your lights, they come charging in. One idea is to collect them in a bucket, turn off your lights and release them at the top of the beach, NOT into the water as they need to imprint their destination before swimming. Coral reef finfish closures are enforced during peak spawning periods, so check first. The closures reduce disturbance and minimise human impacts on this important breeding ground for endangered marine turtles and thousands of nesting seabirds. If you are a fisherman who likes to camp, has a sense of adventure and loves swimming and snorkeling in clear water, the CCNP is for you. There’s not much better than enjoying a cool drink on the beach as you watch the sun set over the water!